I absolutely loved being a part of the Simpson wedding. It was such a delight to work with Megan and Brad. They had a vision of simple and elegant, while incorporating their love of travel. They both have friends and family from all over the world, and to see so many of them come to Portland to celebrate their union was amazing. Although it was not an outdoor wedding, their day had the feel of the one by the use of colors. The bridal party used a vibrant green flora which complimented the darker color palette wonderfully – a gorgeous blend of colors that fit the season perfectly. Rather than using colorful bouquets, white roses were the only way to go, as they are timeless, delicate, and minimalistic. 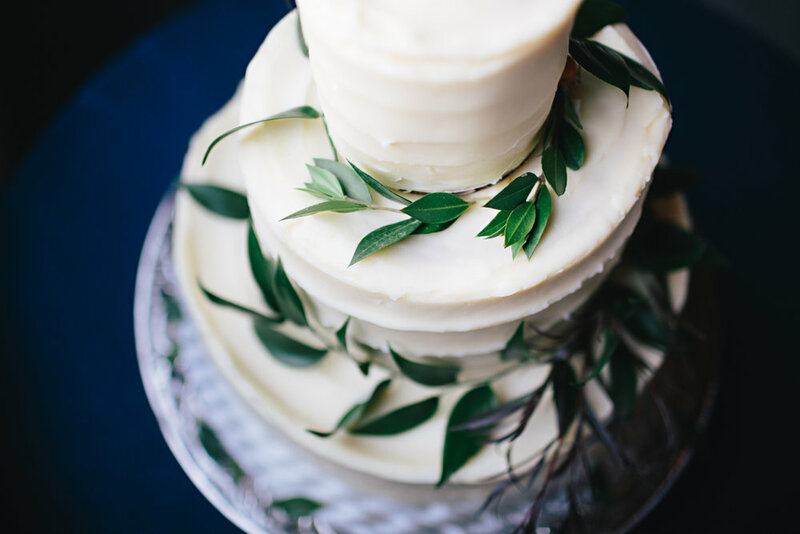 Because simplicity was the main element here, the wedding cake was merely adorned with a few simple green sprigs. This couple loved to travel, so having them use their favorite destinations as table numbers was the perfect way to bring everyone together. They paired each destination with a description explaining the background story so guests could understand the significance of each place. How suiting for such a pair! The night concluded with fresh warm donuts from Pips Donut Truck and a sparkler sendoff. Talk about a perfect Portland wedding. Truly a magical way to start your life as husband and wife!